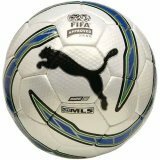 Puma Soccer Balls - find your best option. Which of the Puma Soccer Balls should you buy? Find your answer through my recommendations, reviews and tips. perhaps as good as the others. 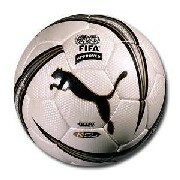 Puma Soccer Balls are usually less expensive. They are less expensive than other soccer balls, which include similar features and technologies. 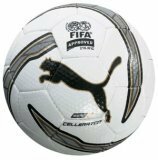 Puma Cellerator Zero 5 - besides original, there are two other versions that you need to be aware of: Puma Cellerator MLS Match Ball (very often called Puma MLS Match Ball) used in MLS and Puma Cellerator Shudoh Match Ball used in Europe. All three versions are FIFA Approved and simply are identical (just different logos). Size 5 only. Puma King SL - as opposed to Puma Cellerator that has its cover made of Dimpled PU, Puma King's cover is manufactured from soft carbon PU. Size 5 only. 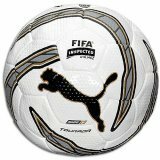 Puma King NFHS - unlike Puma King SL (FIFA Approved), this ball is FIFA Inspected. Otherwise they're both the same. Size 5 only. 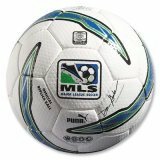 Puma MLS Match Ball (Replica) - again FIFA's test is the only difference between this ball and official version. Replica is FIFA Inspected. It comes in sizes: 4 and 5.
without MLS logos. Size 4 and 5. 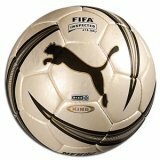 Puma Attacante - regular PU used for cover panels as well as lack of FIFA Approved and FIFA Inspected tests make this ball the least expensive of Puma soccer balls. It is still good quality, every day practice soccer ball, especially for younger kids since it comes in all three sizes: 5, 4 and 3. Perimeter Balance Technology (PBT) - Compensates for the weight of the valve and guarantees 100% shooting accuracy with excellent trajectory. Puma Air Lock (PAL) - Patented valve construction that guarantees protection against air leakage. 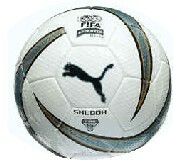 Puma Cellerator, Puma MLS Match (Replica) and Puma Tourada are manufactured of so-called Dimpled PU. The tiny dimples on the ball's surface, according to Puma, cause less drag and more lift than a regular surface, which provides further, higher and faster shooting speed. This technology matches the physics designed in golf balls. Puma King SL and Puma King NFHS have their cover panels constructed from special carbon PU that is believed to provide an excellent touch of the ball. Basically the first five balls are almost identical. Sure there is a difference of couple more backing layers (layers of material between the cover and the bladder) between them and some of them are FIFA Approved and some are FIFA Inspected. Sure there is a difference (visually noticeable) between Dimpled PU cover and Carbon PU cover. But in general all of these Puma soccer balls are very similar. 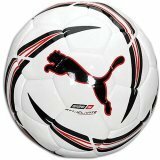 If you are looking for a Puma soccer ball in size 3, the choice is easy: Puma Attacante. how thick your wallet is and what kind of deal you'll find. just to give you an idea what to expect. But if you have patience and time on your hands, search for bargains and discounts. Cover: 32 Dimpled PU panels - The tiny dimples on the ball's surface, according to Puma, cause less drag and more lift than a regular surface, which provides further, higher and faster shooting speed. This technology matches the physics designed in golf balls. Cover: 32 Carbon PU panels. Tip ! As you probably already noticed, unlike Puma King SL that is FIFA Approved, this Puma soccer ball is FIFA Inspected. Otherwise they're both the same. However, the price difference is pretty significant. and it's easy on the wallet, too. Tip ! The least expensive soccer ball probably of all soccer balls with the same qualities. Great ball not only for the youngest kids but also for anybody who can't or doesn't want to spend more than $20 on a soccer ball.